Seems everywhere you look today you see rainbows, leprechauns, mint and chocolate, or more accurately, mint and chocolate together. Though I made these cookies about a week ago, and they're long gone, I thought St. Patrick's Day would be the best day to post about them. Don't get me wrong, they would be fabulous any day of the year! This tasty recipe comes from Samantha of Flour De Lis:) If you aren't familiar with Samantha and her cookies, you need to definitely check out her blog! This recipe is a cut-out cookie recipe and I used my 3-inch, round, scalloped cutter which produced such pretty cookies. I made them into sandwich cookies with Nutella taking center stage. It was the perfect complement to the mint! They were a hit and we all gobbled them right up! 1. In large mixing bowl, cream together butter and sugar until smooth and fluffy. 2. Add egg, peppermint extract and green food coloring. Mix well. 3. In a separate bowl, combine flour, baking powder and salt. 4. Add dry mixture to creamed mixture in 2-3 additions. Mixing lightly between each. 6. Roll dough into ball and place on lightly floured surface. 7. Roll out dough and cut into desired shapes. 8. Place cookies on cookie sheet and freeze for about 10 minutes while oven preheats to 350 degrees. 9. Bake cookies for 8-10 minutes depending on size. This recipe makes about 18 yummy sandwich cookies. This looks like a recipe I need to make ASAP! These look amazing!! 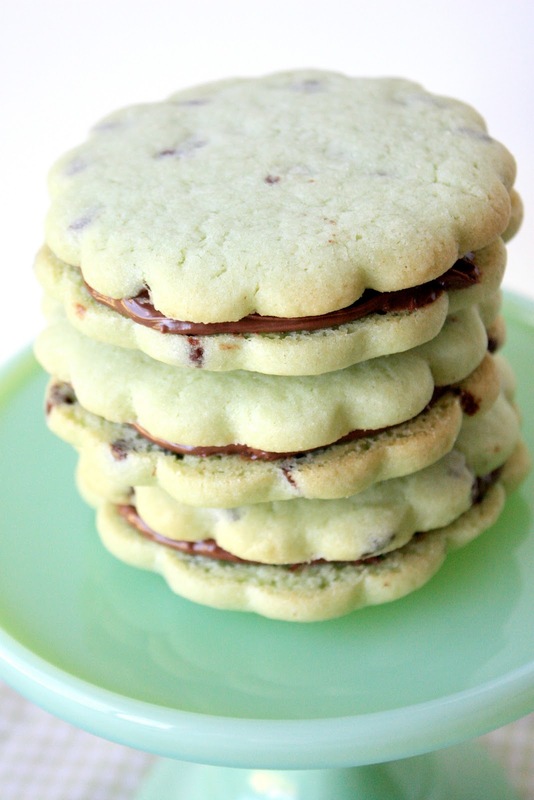 My neighbor is crazy for mint and nutella, I am definitely making these for her! I can imagine what a big hit these cookies were. Great idea to sandwich them with Nutella. OMG, Sue, these look amazing and delicious. There's nothing like mint with chocolate, yumoriffic! Happy St Patrick's day to you too. I'm not Irish but living in the UK I'd consider myself quite close, lol! I was just thinking about how much I want to make mint chocolate chip cookies. Adding Nutella? Genius! Perfect all year long. Dear oh dear. How am I meant to stay on my wedding dress diet when posts like THIS pop up? But really - this is perfect. I would love these, great recipe! My friends think I'm crazy for not liking mint, but I'm just not a big fan of the flavor. I would definitely make these minus the peppermint extract though! I'm super eager to try Samantha's recipe! Adding Nutella was genius! My son will be excited if he sees these Nutella sandwich cookies. You are so clever adding mint into these cookies for St Patrick's day baking... I always admire your creativity. I love this nutella and mint combo and they are sooo pretty..
Hope you had a great St. Patrick's Day! These cookies look amazing. I just found this...don't care if it's not St Paddy's Day...I LOVE chocolate and mint!!! Thank YOU!!!! I am soo excited to have found my way here! I am gonna make these but with a red coloring for my Christmas cookie tins.